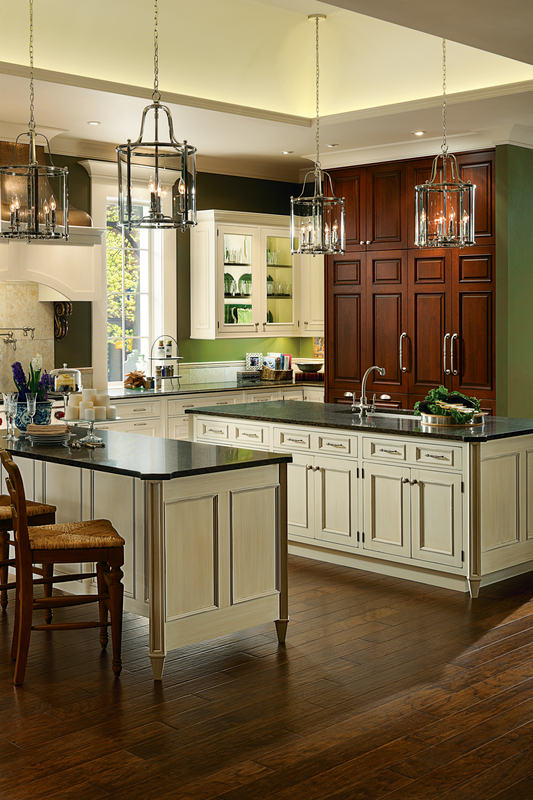 French country-style kitchen with Duboise door style by Premier. 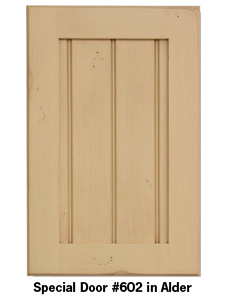 Stanford door style wtih Stanford framing bead by Premier. Old World cabinet style, English/Formal. 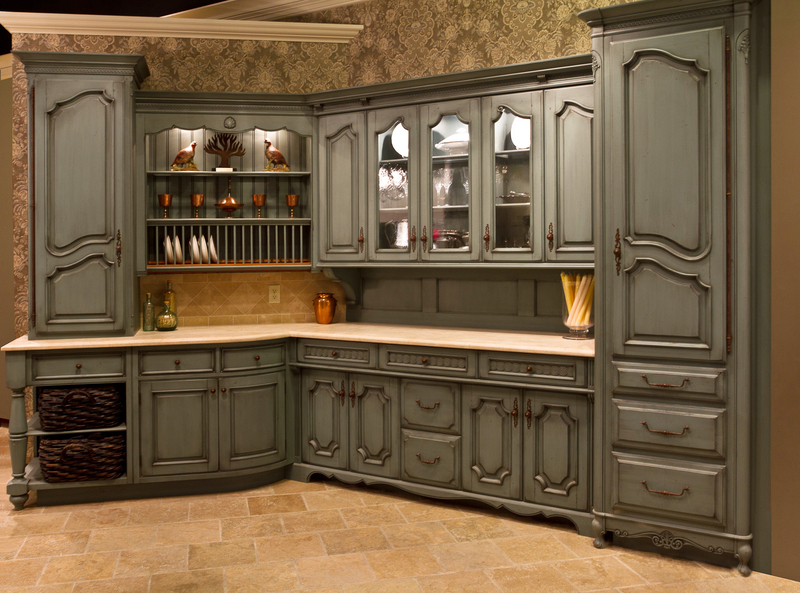 Photography courtesy of Wood-Mode, premier and Crestwood, Inc.
Old World cabinet style, French/Formal. Photography courtesy of Wood-Mode, Rutt and Crestwood, Inc.
Old World cabinet styles, European Country. Photography courtesy of Crystal, Premier and Crestwood, Inc.
American Traditional cabinet styles, Early American (1620-1740). Photography courtesy of Crystal, Crestwood, Inc. and Wood-Mode. 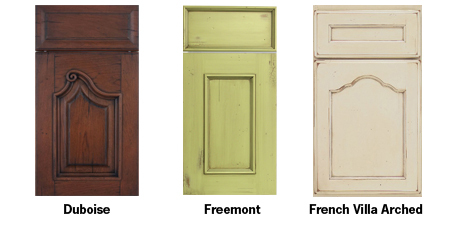 American Traditional cabinet styles, Early American/Formal. Photography courtesy of Crystal, Crestwood, Inc. and Wood-Mode. American Traditional cabinet style, Pennsylvania Dutch (1720-1830). Photography courtesy of Crestwood and Premier. 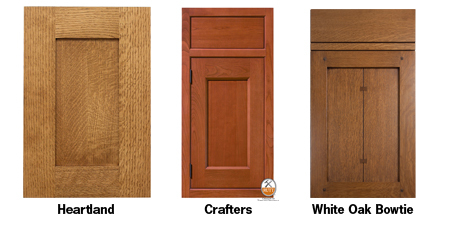 American Traditional cabinet styles, Shaker (1820-1860). Photography courtesy of Crestwood, Inc. Relegated to a scullery or outbuilding, the kitchen has gradually evolved into one of the most important rooms of the home. Today’s open floor plans have transformed the kitchen into a space for entertaining, as well as preparing meals – a gathering place where style now rivals function. Whether remodeling or building a new home, cabinets are the most visible of a kitchen’s components and fundamental to its design. The choices are virtually endless – vintage or contemporary; stock, semi-custom, or custom; materials, hardware, and finishes; raised or recessed panels… the list goes on. While the decisions can seem overwhelming, ultimately it’s a matter of your personal taste and flair. Characterized by design of the Elizabethan to Georgian periods (1558–1811): Ornate, rich, and elegant. 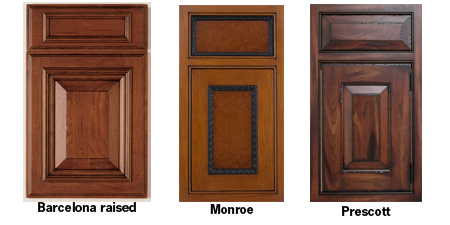 Dark finishes and classic woods, predominately oak, walnut, satinwood, and mahogany. Retains certain motifs from the earlier Tudor period, such as Gothic and “tombstone” arches. Intricate carving, fanciful shapes and forms, restrained rococo elements. Inlays and veneers. Neo-classical styling of the Regency era (1811-1820) emulates Greek and Roman design. Reflective of the Renaissance to Empire periods (1610-1815): Highly decorative and ornamental. Flowing lines and curves. Carved reliefs, emblems, and brackets. Scrolls, half-heart motifs, gold leaf. Dental and egg-&-dart moldings, cove detailing. Lavish, exuberant ornamentation during the Baroque period (1643-1715). Neo-Classic era (1715-1792) revived classical lines, Roman arches, fluted columns, carved friezes. Empire period (1800-1815) continues clean, geometric lines with judicious use of antique forms and decoration and imperial symbols. 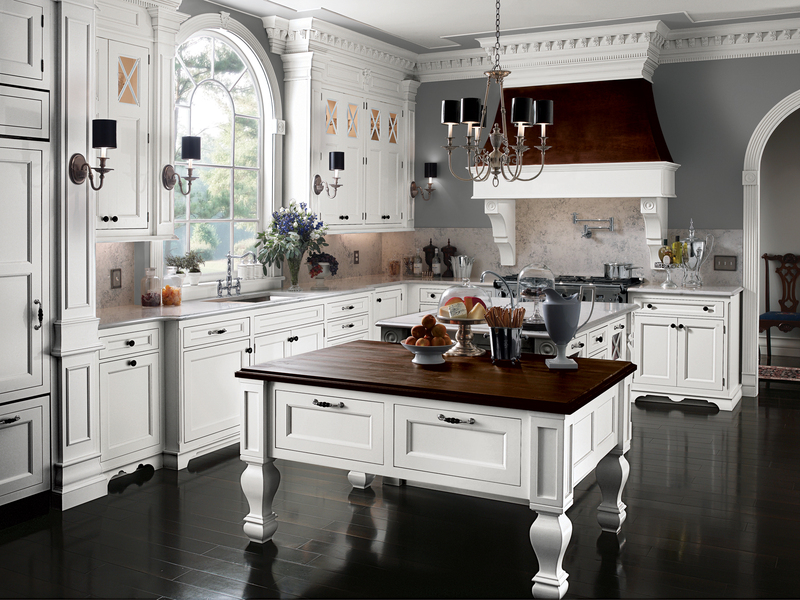 Traditional or rustic, European Country kitchens are a delightfully eclectic blend of Old World elegance and homey comfort. Materials, period styles, and finishes – wood-stained, painted, distressed, or glazed – are often combined. English Country: Emphasizes patinas, “aged” look. Beaded and inset glass doors, wire or metal inserts, turned posts. Light and/or bright colors. 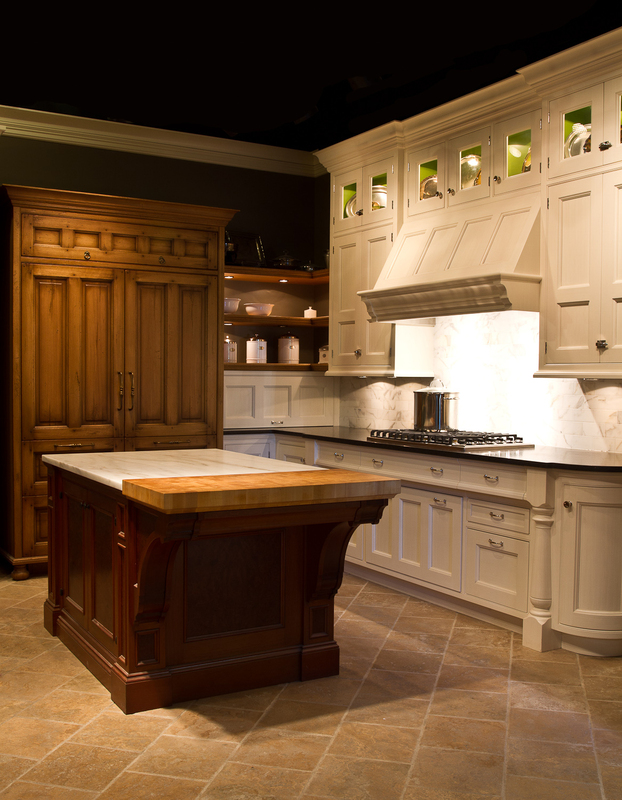 Country French: Cabinetry typically very dark or very light. 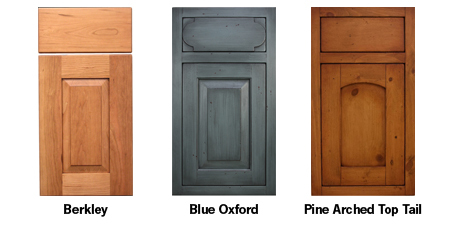 Painted finishes range from earth tones to ivory, French blue, warm gold, and red. Leaded glass and wire grille inserts, antique brass and copper accents, beadboard, and tongue-&-groove. 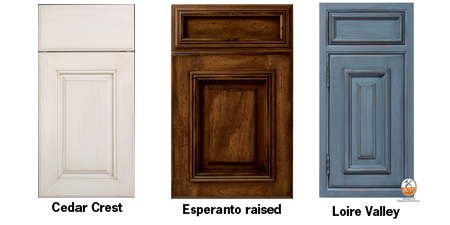 Tuscan: Rich wood stains, antique and distressed finishes. Warm Mediterranean colors and wrought-iron accents. Early settlers relied on readily available woods – knotty pine, maple, cherry, walnut, oak, birch. Simple details and panels. Modest, utilitarian, little ornamentation. 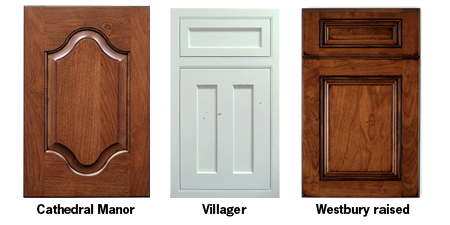 Cabinet doors suggested for early American home styles still popular today, Cape Cod, Southern Farmhouse, Dutch Colonial, Saltbox: Inset, recessed panels, maple or oak stains. Although heavily influenced by Dutch, English, and European styles of the same periods, American furnishings tended to be more conservative and less ornate. 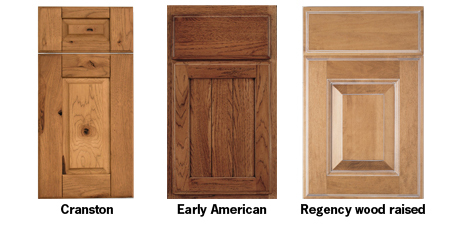 Recommended cabinet doors for architectural styles from 1740 to 1860, including Georgian, Federal and Greek Revival: Lipped or full overlay, recessed and raised curved panels, pulvinated friezes, painted or cherry, oak, or maple finishes. Queen Anne (1830-1880): Lipped or full overlay doors, raised square panels, stain or paint, cherry, maple or oak. Gothic Revival (1830-1880): Inset doors, beaded square panels, stain or paint, cherry, maple, or oak. Victorian (1840-1910): Draws from Federal and rococo. Complex curves and shapes, arches. Diagonal beadboard, leaded glass, elaborate carving, bull’s-eye motifs. Dark woods and painted finishes. “Beauty through utility.” Straight lines, bun feet, mushroom knobs. Predominately maple, sometimes cherry, birch, or walnut. Sturdy, simple, utilitarian design. Flat panels, vertical and horizontal lines. Quarter-sawn oak preferred. Weathered and distressed finishes.